© 2017 by Shweta Narayan. | Art © 2017 by Randy Gallegos. Then the Bird of A Hundred and Eight Names gathered together her three new children, and she said, “You have passed our people’s tests and joined our ranks, and may leave if you wish. But leaving will take you among the Alabar, who collect salt in their bare hands and have no fear of rust, and call themselves merely people. “But would it kill us to learn about them tomorrow?” whined the golden monkey Usithan. Usithan chittered and jumped, teeth bared, from bench to worktable; but great-springed Anbu said, “We’re not so ill-made as to ignore our mother’s teaching,” and their saying so made it true. For the others would take themselves apart before disappointing the eldest, whose voice brought to mind the Goddess of Speech as their form resembled an idol cast in bronze, who brightened golden anklets and bracelets and necklaces by wearing them, whose gentle reason had stopped their arguments from the hour they’d all been brought alive. “So you can better annoy Maari?” said their mother. But she flew to the courtyard, where warm wind and sun-baked stone might calm all her children’s restless gears, and there she spoke poetry in three languages. The bloodiest of Alabar leaders call themselves the Three Crowned Kings; they say this world is theirs, and that bloodshed is a virtue. They ride so often to battle, against one another or lesser killers, that the crows all know and love them. The Chera kings, most distant of the Three, live over the mountains and have fought us only for trade routes. May the gears that turn the stars keep it so. These gem-studded ones call themselves children of fire, and in Vanji, their capital, firelight makes the temples themselves dance, so cleverly are the figures upon them carved. That land is blessed with plenty by the river Chulli, fortified by steep mountains, and protected by engineering they’ve never dreamed of; for downstream of Vanji where the river meets the sea is built Musiri, beloved of the West, whose traders deal in all the world’s goods. So many ships ride the rains there each year that their sails block out sea and sky and outshine lightning. We cross into those lands only rarely, even now, but we care for the Chulli’s flow as our own heartspring, for a calamity along that great river would spill over the mountains onto us all. The Pandya name you know. Clever in craft and commerce, the moon’s children rule from here in Madurai and sell their cotton, light as moonlight, to nobles so far off as Europa, who are as greedy for it as for Tamil steel. The Pandyas have been our allies and partners in trade for as long as their queens have ruled, and so many of their generations have passed that they think it was always so. You, who were made to join their court, need to know that it wasn’t. The Chola kings rule from Udaiyur in the north. Alone among the Alabar, these quick-tempered children of the sun have harmed us and lived. For the greatest of my children died of Alabar treachery not just once, but thrice; and it started in Udaiyur. There lived in Udaiyur a great king of the Cholas, who they now call Vikramaditya, though at the time he was known as Varsembiyan as well. The tales of him speak of great feats of might, compassion, and justice. Don’t groan, Usithan, I won’t repeat the stories you’ve already studied. Those were written by Alabar, and say far more about them than us. And while they love to dwell on him trudging back and forth across a corpse-burning ground while carrying that Vedala-possessed corpse and coming up with an answer to each riddle, they never can explain how he managed it without collapsing from exhaustion and foul air; for of course they refuse to admit that Vikramaditya of legend was no man of their kind, but a mechanical. —Maari, my dear, your ears speak so clearly of skepticism that a lecturing brahmin would notice. One flick would have sufficed. What is it? Usithan, unwilling to agree, picked up a few message tubes and started juggling them. “Is that how you speak to our mother?” said Anbu. Many tried to kill the great king Vikramaditya, for he reined in the greed of the powerful. But he was of course untouched by poison, and stronger and sturdier than any Alabar. He was faster, too, which you might predict; but his assassins, repeatedly, did not. He had only one weakness: Kabilan, his heir, a descendant of his Alabar father who he had adopted as his own and loved dearly. Prince Kabilan was fearless in the hunt, handsome and well-spoken in the palace, and seldom truly unkind; but he did not love as deeply as he was loved. Eventually—perhaps inevitably—one of the king’s enemies turned their poison into words, and dropped it into the prince’s ear a little at a time. It started with admiring comments scattered into his days: How long the glorious king had ruled! May he rule forever! Perhaps he would, being divine as kings are and mechanical, too. Do mechanicals ever grow old? asked a pretty girl, sad-eyed. It must be terrible for the king, to see his own son age before him. Next the prince noticed whispers that stopped when he drew near. How long had that been going on? He went on the hunt and uncovered a pair of servants wondering, a little too loudly, what reward there was in loyalty to an heir who would never be king. That same evening, his own attendant hissed to see—he claimed—a gray hair, immediately plucked and thrown into the fire. Then a dying scholar insisted that mechanicals, who had no breath, could not have souls, since the Sanskrit word Atman means both. With such droplets from all directions was the prince drenched in poison, till in place of a father who loved him he saw a clever device, ticking on forever, robbing him of his throne. So it was surely inevitable that one evening, instead of winding his father up while speaking of his day, prince Kabilan forced the key the wrong way and wound him all the way down. Three message tubes hit the ground. Usithan caught the other two, barely. “Wound down isn’t the same as dead!” he said. “You gave your child a forbidden form?” asked Anbu. They could not frown, as their brow was made all of one piece, but they placed one hand over their mouth in a gesture of shock. “Years of experience,” their mother said. A clang, a yowl. A tube bounced off Maari’s head, spinning on itself until Maari’s paw brought it to an abrupt stop. Usithan said innocently, “Of course, dear mother. Besides, I’d hate to break this.” He twisted one tube to its speaking position, and from it came Maari’s startled yowl. A little low and slow, and cut off at the end, because message tubes were far from perfect, but close enough. Maari growled. Maari and Usithan stared at Anbu, then at each other, and fell silent. One of Vikramaditya’s oldest and most favored servants was a Kammalar named Nakkiran, a small, round, neat man who kept his gears clean and oiled and did what basic maintenance Alabar have the craft for. Nakkiran was a mouse to prince Kabilan’s tiger, timid and high-sprung, and well acquainted with the palace’s hidden spaces and paths. And while only Kabilan had the duty of winding the king, Nakkiran too possessed a winding key. When word of the king’s sudden death wailed its way down to Nakkiran, he was halfway to the royal chambers, bent over the stairs, wheezing and dripping salty sweat and wondering when the five flights had grown so steep. He looked up in shock, and a golden oiling can slipped from his hand to bounce clattering down the stairs. He ran after it, while the gears of his mind slowly started turning again: the king, dead. Stopped. Not ticking. Who kept the king’s gearwork in order? One Nakkiran. Who would be blamed, then? He tripped down the last three steps, grabbed the dented vial, darted into the nearest storeroom, jumped into a large woven basket, pulled the lid down after himself, and started shaking like a lotus in a strong current. The basket was too tight-woven for him to see more than fuzzy circles of light as people rushed by carrying lamps, but he could hear, and in time he calmed enough to listen. To running feet, voices shouting over one another, snatches of panicked whispering passing by the storeroom, one shrieking laugh. Kings, like other gods, did not just die. Not without battles or age or illness to curse for the disaster. Nobody asked whether misfortune would follow, only what form it would take. Would the rains fail? Cows sicken? War burn down the cities? Prince Kabilan would save them, said one voice, then another, building a raft over dark water. He was strong and brave and handsome, and once the rituals of coronation were observed, why, then they would be safe. And as evening slowed to iron-black night, and Kabilan’s name became a prayer, nobody cursed Nakkiran, or said he had failed, or even asked where he was. In truth, half the servants and all the nobles had forgotten him entirely, for who remembers a mouse when there’s a tiger to crown? When silence convinced Nakkiran at last that prince Kabilan wasn’t going to call for his head, or summon him to explain—or even attempt a repair—suspicion grew to balance out his dread. It took him hours to talk himself out of the basket, but, slowly, seeing spears and crocodiles in every shadow, he crept up the stairs. He passed the chambers of the queens as silently as any mouse and paused at the archway to the king’s chamber to check for movement. The smell of sour liquor hit his nose, and his shoulders unwound till they were no longer quite touching his ears. Whispering thanks to Kottravai for shrouding him, he skittered past snoring attendants to see if Vikramaditya was truly dead. Nakkiran, whose younger brother’s children had children of their own, was somewhat taken aback. “But surely, my king” he whispered once the hand was gone, “the prince—king—no, prince—will want to know . . .” He trailed off. This much, Nakkiran had no trouble agreeing with. Vehemently. Poor Nakkiran nearly fainted, though whether of terror or excitement even he could not say. He’d seen the king’s heartspring, of course. It was the piece that gleamed nearly purple, forged of a metal unknown to men; the one part he was never on any account to touch or even breathe on. Moreover, at that time no Alabar had so much as seen our sangam. It was housed not in Madurai, but far from Alabar lands. “Still don’t believe it,” Usithan proclaimed. “The mouse befriended tigers?” said Maari. Maari’s gaze shifted to a squirrel on the roof. “Vikramaditi’s heartspring came to me half-crushed, more by his son’s betrayal than the journey. Once mended, it uncoiled to a fiercer, more feminine rhythm, so I made a body modeled on Alabar sculptures of women, its weight not rising but flowing soft as Madurai muslin to the ground. It stood no taller than Alabar women, its gearwork both finer than before and contained in a generous roundness of breast and belly. “On seeing me base my forms on Kammalar work, Nakkiran was at first wide-eyed as an owl, and saying ‘Ohhhh, Oh!’ like an owl too. But he recovered, and we learned much from each other. So it was that a marvel came to Korgai, city of pearls: a parrot unlike any mechanical the people had seen before. Her body shaded from brushed gold to verdigris, and emerald-green flashed from her wing and tail feathers. More astonishing still was her head, gleaming as if feathered with slivers of amethyst. The fine copper-work of her beak and claws went nearly unobserved against this glory, except to the jewellers. And it was to the market of jewellers that she flew. In that time, what trade we had with Alabar went mostly through Korgai, but we weren’t partners in trade to the makers of jewellery. We were competitors, and fifty pearls is a high price to pay for trusting the wrong person. So they hesitated, and argued among themselves, and nearly stopped admiring the parrot in their unease, until a very young person came forward. The full tale of how that young Kammalar became the Pandya queen’s jeweller must be left for another time. You need only to know that she was pleased with their work, and summoned them to Madurai to offer them a boon. “Great queen,” they said, well-taught, “for myself, the brilliance of your presence is boon enough.” Nor were they lying; the elderly queen was splendid. Her face was cracked with wrinkles like land awaiting the rains, her hair flew above like the clouds they wait for, and her expressions shifted quick as lightning. Her grand silks and jewels seemed simply fitting. When the Pandya queen descended upon King Kabilan, every tongue in the Chola land spoke of her. Mostly with questions. In the temple courtyard and markets: Had she brought her pretty granddaughters so that one might charm the king, to strengthen blood ties between the lands before she died? What might that mean for the future of Tamilagam, and, most importantly, for trade? And in the palace: Did she know the chief minister had been pushing for Chola control of the strategically vital Palakkad pass, and for annexing the Pandya territory around it, since the moment Kabilan had been crowned? If she did know, who were her spies? But she’d arrived with a retinue of women and only a handful of guardsmen—did that mean she still saw the Cholas as allies? More quietly, in the king’s chambers: If she knew, was she pushing Kabilan to choose between power and honor? Making sure everyone would see how he treated women who visited in peace? Would she risk her own life to test him so? She was old . . .
She arrived in impressive state, her golden chariot like the sun, her white hair outshining its jewels, heavy rainclouds following her as though summoned. Perfect Korgai pearls edged her bracelets and armbands, and the silk that framed her breasts. Even her horses, proud Arabians all the same shade of brown, wore pearl-studded harnesses. In all this splendor, the mechanical parrot that rode with her went unremarked; and Vikramaditi, after three days of saying “You’re a pretty parrot” to everyone and repeating words as if she understood nothing, was able to flit around the palace as if unseen. “Be quiet,” Anbu said fiercely. The elderly queen, meanwhile, got up the stairs to her guest chambers perfectly well, even waving off her attendants; but then her leg became all at once fragile and unable to bear any weight, so that her hosts had to visit her. Such a pity, she told them with her small smile, that they should be inconvenienced by her frailties, but where was the point in raging at the whims of gods? Mortals had no choice but to adjust—as King Kabilan had done so marvelously on his father’s sudden death. The poor boy must be greatly distressed, but he didn’t show it at all, did he? So she was able to mark each visitor’s response, while her granddaughters and nieces and attendants, scattered around the palace, heard what ministers and poets and princes said to one another after speaking to her. Her granddaughter Meenatchi followed Kabilan around, listening with scatterwitted admiration to his every word and asking soothingly ignorant questions. On the third day, with her character established, Meenatchi managed to get so thoroughly lost that Vikramaditi had time to confer with her unnoticed. She made enough wrong turns to find Kabilan again, then joked about how people should visit her instead; he generously offered to visit her that night, an hour after dark. She told him with earnest innocence that all the old ladies would be in bed by then, so if he wanted to visit Grandmother too he must do so earlier. Then she flitted off to admire Kabilan’s chief minister, and soon he had plans to visit her two hours after dark. 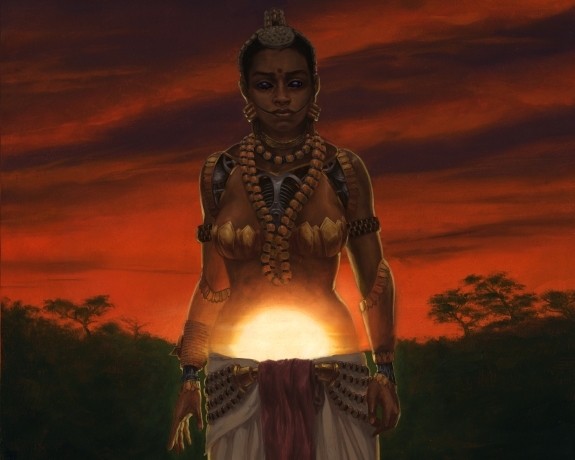 “First let me anoint the noble king,” said Meenatchi’s attendant, a large dark lovely girl, “so that he may better distract my princess from her troubles.” She guided him soothingly to a chair, removed his necklaces and armbands with admiring murmurs, and massaged scented clay into his hair. Then she started to rub sandalwood paste over his chest and back and arms, and even his face, removing his garments and jewellery as she went. At first he was soothed, by expert fingers and ritual both, but the ripe stench of sewage slowly grew. By the time she removed his lower garments and started on his feet he was breathing only through his mouth. He’d smelled worse on battlefields, but not in bedchambers. In the silence, he did: footsteps trying to be stealthy. While Meenatchi spoke, the attendant came to her feet, pulled him far too hard, and shoved him into the trunk with far more strength than he’d credited her with. She shut the trunk just as footsteps reached the door, and sat on it. Inside, in the stifling dark, Kabilan swallowed hard, for the smell kept growing worse. He wondered if it came from the trunk itself. Which it did, in a way; for the girls had mixed indigo dye into the sandalwood paste he’d been so thoroughly covered with, and wet indigo, as it warms, smells much like fresh dung. In this state, Kabilan was less than pleased to hear the deep, perfectly modulated tones of his chief minister’s voice. Which was both false enough and true enough to sting. She sounded as helpless as a maiden really shouldn’t when she has a naked king trapped in a trunk, and Kabilan started to smell something off. Something besides the actual smell. He tried to muscle the trunk’s lid up; it creaked, but didn’t budge. Meenatchi’s attendant slipped off the shuddering trunk and into its shadow, silent against the wall. Naked, purple, and furious, hair wild and matted, eyes and bared teeth flickering with the light: Like vengeful Sivan himself, Kabilan burst from the trunk in a cloud of stench. His chief minister took one look and fainted dead away. Kabilan’s fury, robbed of its first target, turned on Meenatchi. “You—!” he bellowed. Kabilan couldn’t show his face in public for weeks—not for the chief minister’s execution, not even for those sacred rituals which brahmins say the land can’t thrive without. He had to pretend to be ill, which mortified him only a little less than being purple. With the chief minister’s plotting revealed, though, and the army calmed before it had massed to demand blood, nothing too terrible happened. Even without rituals, the rains continued, and Chola hearts were warmed with tales of the Pandya queen’s loving attendance on their sick king, how she treated him as her own grandson. That last was true. She scolded him quite as though he was her grandchild, age about seven. She asked, after he admitted remorse, how he planned to save his land from divine or mechanical wrath; for as the Pandya line knew well, the two were much alike. Did he think he could take a brahmin into confidence? Someone like his late chief minister, perhaps? If Kabilan could have fallen into the floor just then, the Chola line would have ended. “And that one gave judgment,” Anbu said. “Perhaps if it wasn’t for the smell?” said Anbu. “You should be a hound,” said Usithan. “You keep chewing that one bone.” And being well practiced, he leaped onto the roof before the last word, leaving a laughing message tube behind. “Are you saying you love Maari?” they teased. Their mother spread her wings. “The point of this lesson,” she said, “is to find your answers. Not mine. I’ll say this much: that from that time they abandoned the name I gave them, and used Ramaa when more female and Raman when male, for their bruised heartspring could only continue by counting their past self dead. “They kept the parrot form for many years, getting me to change only their head coloring, redder when they were more male and more purple as their heartspring shifted again to womanly. Chola fortunes fell before the Pandyas; Alabar built homes and farms and towns, always increasing, till we moved our sangam finally to Madurai. Your sibling still lived among them—though never again the Cholas—advising, telling stories, and gathering information for our traders. They even went west over the sea with a merchant once, as far as Aksum, in the years before trade from Rome gave way to Greece. “The parrot form suited them, both for how beautiful it was and how easy to ignore. Some Alabar tried to cage them, but none managed, and nobody in all those years tried to kill them. It was still functional, more or less. I build these forms to last. But it needed buffing, oiling, and extensive work in the legs, which had suffered from some year’s floods. I had been reading of certain Greek innovations, too, and wanted to try using pockets of trapped air to absorb shocks. Ramaa told me much about their travels while I worked, but left out the reason for their sudden need. Eventually, I asked. I paused with a tiny screw held in my beak, dropped it into a cup. “Not this generation,” I said. When the body was fit to wear, Aathan the broker was not the only pretty youth to court Ramaa; he wasn’t even the best known or respected, not with the new queen’s cousin singing rather bad poetry to our windows. But Ramaa barely noticed. It fell to me to gently discourage them. —Yes, laugh; but you know I have trouble with “gently.” In any case, they left. Soon after the rains that year, when Madurai itself stood clean-washed and anointed with sandalwood, lush with dyed silks as if garlanded with blue kurinji, Ramaa married the broker. By then I felt silly about my earlier misgivings. Aathan looked and smiled at Ramaa as if they were the whole three worlds, and moreover he spoke with them about matters both grave and trivial, and laughed with them too. He thought of them as a woman entirely, and was baffled by our more neutral language, but Ramaa didn’t mind. For do not most of us respond to the words for women, rather than explain our full nature to Alabar? For a while I thought the old dents and scratches in their heartspring would smooth out with new joy; and for a while it was true. Aathan’s trade grew as Ramaa started helping, and making connections he could not, till their only worldly trouble was deciding which temples and schools to fund. And if Aathan laughed less, that comes to us all with age. So I created the form of a mouse with a coat of darkened bronze, lined it with oiled muslin, roughened the metal till it was dull in any light, transferred my heartspring into it, and went to spy on Aathan. I recommend the form for this purpose; if Alabar see you, they’ll be too busy fussing to notice that you’re mechanical. But the mouse’s landscape is one of small dark tunnels with bursts of noisy light and large stomping feet, and I was less than happy to find Aathan in the river itself—on a crowded and noisy boat with one long narrow plank to the dock. Who holds their party on a boat? As I discovered at the price of a squashed tail and a frantic dash for the gap between two barrels, that night the answer was: those who hide from both our kind and Pandya law. Some voices I knew, had thought were friends. And the enamelled goblets from which they sipped mango juice and western vinum were our work. But the conversation—! On barring the wind-ups from overseas trade, using the Greeks’ disdain for their own automata, bypassing guilds and their laws. Whether to shift trade to mechanical-free Musiri and up the Chulli to the Chera capital, where to meet next time, free of ticking. And there was my child’s husband, welcomed by these men, conferring with some, laughing with another group more freely than he’d laughed with us in years. But what do you think he did, when Ramaa asked why he visited people who meant them ill? He laughed as he’d done on the boat. There were more traditional topics for wifely scolding, he said. Ramaa should know he didn’t despise us, since he’d married her, and brokers had to make friends everywhere, and didn’t Ramaa have contacts who didn’t work with him? But Ramaa was calm, though he didn’t understand it; battle-calm. Rage pulled their heartspring too tight for smaller feelings. The next time Aathan met the crooked merchants, more than half of Madurai’s mechanicals showed up, too. We hid till they’d said too much, then showed ourselves all at once; cornered, they scratched and screamed like rats. How could we have found them? We didn’t accuse Aathan. We didn’t need to. His work withered under a mistrustful sun, and if his tale ended there, its lesson would be for Alabar to learn, not you. But Aathan was not Kabilan. The blow taught him only that mechanicals are cruel. He railed at Ramaa when they tried to mend the marriage, calling them vicious names before storming out, and from there his silence and absence only grew. I forgot you never knew their taste. The beat of a beloved heart. He wasn’t on any ships’ lists, not that any would sail till after the rains. And fisherfolk, like everyone, claim to follow the priests’ rules; but tales said they’d take a willing passenger out to sea for a price. And Aathan’s poems spoke the messages he meant them to. Rage and worry twisted Ramaa’s heartspring . . . let’s say doubly tight, since we tell Alabar that’s how heartsprings break and in Madurai you never know who’s listening. Ramaa’s was too strong to break, too hurt to power them. They’d sit still for entire days, answer a question a week after it was asked. Aathan’s one wise choice was getting far, far away from me. There’s nothing to do for a heartspring so wounded, but though my own whispered high with fear, your sibling persisted, and I saw that they could heal in time. But the windings of the greater gears are not for us to know. Our merchants in the north sent word of trade vanished all at once, like streams in summer, in Pataliputra itself. They told of stories that travelled in whispers, each one a small gemlike poem, each one painting us as things. Dangerous, impossible to know or trust, betraying those trapped by our beauty. The tales were in Prakrit and unclaimed by any author; but we knew that voice, those details. Our merchants, with all sixty-four of the great city’s gates shut in their faces, pleaded for help finding the author before they were ruined or killed, or Gupta armies came down on all Tamil peoples. But he’d be using some northern name we couldn’t guess, and claiming some other trade. Ramaa held our people’s only hope against him: a small portrait on lacquered wood, kept close even through grief. So I let their messenger speak to my wounded child. And with that, their heartspring broke. The lengthening shadows carried silence into each child’s heartspring, so that even Usithan and all his voices were still. “Hard to imagine you struck down.” said Usithan softly. “Dealing with Alabar,” Maari said. “Dealing with them gently, then,” said Maari. “So . . . Alabar are dangerous, impossible to know or trust, betraying those who—” He was on the roof the moment Maari’s ears flattened. “No, that’s you,” said Maari. “Then what’s the point of asking,” grumbled Usithan. The Chera king’s Pannikar was quick, but not so quick as the golden monkey who called herself Usha. His arrow stuck, quivering, in a pillar of carven teak. Laughter hooted from a rafter far above in the cavernous throne room. Usha leaped from rafter to pillar to one minister’s head and away again holding his shawl, followed by a shriek of outrage. Waving it cheerily, she danced around the room, more and more of the court chasing after till no guard dared loose another arrow. The mass of nobles finally trapped her hooting laughter in a corner, just out of reach. Everyone stopped. The device in the corner did not. The monkey’s laughter joined it, one jarring sliver higher. “Now,” she said, “where was I before our little game? Never mind. When their mother judged them all ready, Anbu and their siblings joined the court of the Pandya queen. She’d expected only one mechanical advisor, but accepted three with grace like the elderly queen in the story, and humor more like Meenatchi’s. It was far too big, crooked, and made of a paler gold than her coat, but nobody dared laugh. Even the device in the corner had stopped. “The young Chera king,” said Usha, pointing at the top of his head, “was as handsome and well-spoken as Kabilan. He came to meet his friend’s lovely sisters, he said, and was welcomed with joy. But he stole away one night, and it was no princess he took with him but the Pandya queen’s advisor, Anbu. His messenger returned almost immediately with a pretty letter that begged forgiveness, swore friendship, and claimed they were driven by love; but nothing he said of his bride sounded like our sibling. So we followed. “We found the first emerald inside a cloud, in the Palakkad Pass where they land to rest and turn the air to mist. I’m sure Anbu’s beloved knows this—it’s not my place to call a king a liar, after all—but for the rest of you, my sibling’s anklets are hollow. One contains thirteen pearls, perfectly matched, and the other has—had—seven mechanical-cut emeralds as big as the tip of my little finger. The gems are set so that they can’t fall out; they must be pried out after the anklet’s opened, with jewellers’ tools. Or mechanical fingers. “Two different jewellers in the great port of Musiri had emeralds to match the first. Both said they’d bought them from fisherfolk. One was leaving a temple when a gleam by the river Chulli showed him the blessing he’d prayed for. The other found her emerald in a fish. “We didn’t need the other four. The first gem already pointed to the Chera capital. Those found upstream of Musiri could have come from nowhere else, and the message Anbu sent by dropping them was distress. “Which is why—no, don’t move, I’d hate to tighten this shawl in my terror—my sister and I stole our sibling’s heartspring from their body last night while you all slept. Silly Alabar, you think I’d tell you any of this if Anbu weren’t already safe? I’ve been watching daylight dim while I babbled. Maari will be home with them by now, and word’s going out to our people. Usha leapt again for the rafters. A spray of arrows hit the wall behind her. She laughed. More arrows. Another laugh, from another part of the room. And another, and another, till nobody knew where to look. They were still searching when six hooting tubes of bronze fell to the ground. One said in Usha’s voice, “I’ll even give you some advice. If only to annoy my beloved little sister.” Its last word trailed lower and slower, its end more guessed than heard. 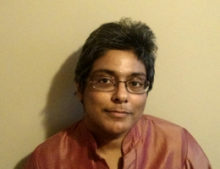 Shweta Narayan was born in India, has lived in Malaysia, Saudi Arabia, the Netherlands, Scotland, and California, and feels kinship with shapeshifters and other liminal beings. Their short fiction and poetry have appeared in places like Strange Horizons, Tor.com, the 2012 Nebula Showcase anthology, and We See A Different Frontier. They’ve been mostly dead since 2010, but have a few stories and poems in the works again. Seven years is a traditional length for otherworldly imprisonment, so they’re hopeful. Shweta received an Octavia E. Butler Memorial Scholarship, co-edits the speculative poetry zine Stone Telling, and feels old on tumblr at shwetanarayan.tumblr.com.